“This is yesterday’s flower,” Michael Donoghue said, pointing to a half-wilted bloom. He was standing in the middle of a greenhouse, surrounded by students. The room was filled with insectivorous plants and deciduous trees, the air heavy with pollen and moisture. The plant before Donoghue had heart-shaped leaves, a spindly stem wrapped around a wire brace like ivy, and two huge burgundy flowers that drooped despondently. It was labeled Aristolochia gigantea. “And this is today’s,” Donoghue added, pointing to the larger bloom. He reached out, turned today’s flower around, and revealed a small, cream-colored capsule behind it. “Flies are lured into the calyx,” he explained, indicating the capsule, “and once inside, they’re trapped. They get drenched in pollen.” Then the flower wilts (it lasts only a day), the calyx collapses, and the flies escape—only to be caught again within the flower of another gigantea. And so the plant pollinates. The students scribbled in their sketchbooks. They were all drawing the gigantea for a class in plant biology: some artistically, others rather unartistically, but all with an attention to detail that they were slowly learning from their teacher. Donoghue stepped back and watched them. He is a short man with a habit of dressing simply and practically, often in jeans and a plaid shirt. His thinning hair and thick beard both turned white long ago. He is 66. But his posture is excellent; his eyes are clear and blue; and his voice is calm and rhythmical—the sort of voice that could read pages out of the phone book without boring its listeners. When you walk with Donoghue, he calls your attention to the tiny hairs on the stem of a tomato plant. He points out the scales on the fruit of an Annona cherimola, shows you the chitinous “sugar apple” of an Annona squamosa. And you have the strange feeling that he is teaching you how to see. It’s as if he’s handed you a pair of delicate glasses, and when you put them on you realize that the natural world has always been out-of-focus. Every leaf now tells a story; every piece of bark hints at its owner’s ancestry; every flower is a subtle contraption waiting for the attention of one who looks closely. Donoghue has always looked closely. He has built a career out of noticing the unnoticed. For much of his life, Donoghue has studied a genus of about 165 shrubs and small trees called Viburnum. These shrubs were the subject of his dissertation and have been the primary focus of his research for the past decade. They are, according to him, not very interesting. Viburnum isn’t one of those plants that grows to be a hundred feet tall. It doesn’t eat insects, or parasitize trees, or grow aerial roots that hang from its branches and extract excess water from the air. It has pretty flowers, but not huge, fly-trapping ones like the gigantea’s. It’s a shrub. It’s one of those plants that most ecologists don’t pay attention to. So, why study it? Because Donoghue likes it and has since he was an undergraduate. Because Viburnum isn’t an extraordinary genus, so insights into its ancestry and genetic makeup translate into insights about many other plants. But most of all, because the more you look at something—even an unremarkable something, such as Viburnum—the more interesting it becomes. “Michael Donoghue” is a household name in the world of evolutionary biology. Look that name up on Google, and you’ll find a laundry list of awards, membership in two national academies, and a Sterling Professorship at Yale. Look that name up on Google Scholar, and you’ll find a list of over 250 scientific papers, some of which have been cited thousands of times. But if you page through that list of papers, ranked by number of citations, you won’t find one about Viburnum until the ninety-second entry. “Michael’s work in Viburnum isn’t well-known,” Erika Edwards told me. “That’s not what he’s famous for.” Edwards was one of Donoghue’s graduate students from 2000-2005; she is now his chief collaborator. She also studies Viburnum. Like Donoghue, she’s better known for her work in other fields. Both of them hope that, one day, Viburnum will be so well-understood that it will become a model for evolutionary biology: a completely solved problem, a genus with a perfectly charted ancestry. Maybe then people will pay attention to it. After all, Gregor Mendel’s peas were just unremarkable garden plants for most of his life, and his experiments were just the hobby of a friar who had too much time on his hands. Until those peas provided evidence for recessive and dominant traits, that is. Until that friar became the father of modern genetics. Eventually the young Donoghue drifted back home to Michigan, where he decided, on a whim, to take a few classes at Michigan State. He liked being outdoors, and while traveling he’d read Darwin’s On the Origin of Species. So he enrolled in courses in biology and plant taxonomy, developed a fast rapport with a geography professor, and found himself accompanying that professor on a field trip to the Great Smoky Mountains National Park. There, in a cold forest at the top of one of the highest peaks in the Appalachians, he was captivated by an odd-looking shrub. The year was 1972. The shrub was a species of Viburnum. Donoghue graduated from Michigan State, earned his PhD from Harvard in 1982, then drifted from university to university until finally settling at Yale in 2000. 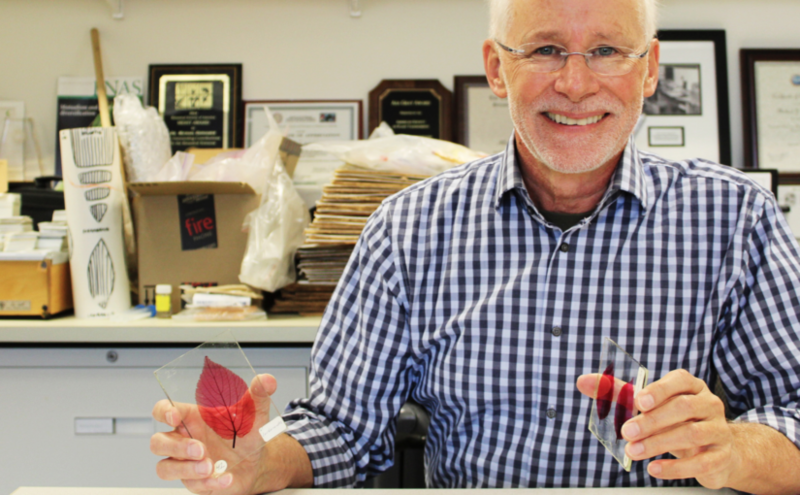 He was director of the Peabody Museum from 2003-2008, has been a Sterling professor since 2011, and is widely recognized as the world’s leading expert on Viburnum. 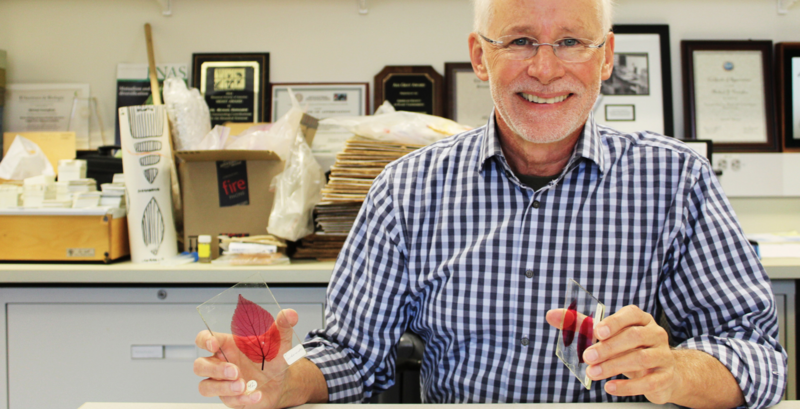 As an evolutionary biologist, he tries to understand how physical characteristics of plants evolved over time. Unfortunately, most plants have poor fossil records. It’s often impossible to find million-year-old specimens, extract their DNA, and figure out how today’s species evolved from them. So instead, Donoghue compares the DNA of modern plants, looks for similarities, and tries to infer the past from the present. The scientist looked at me expectantly, as if he was waiting for an answer. On the table, he had spread ten dark crimson leaves, each of them dried and pressed into display frames as if they were butterflies framed in glass. Some were long and smooth like the leaves of a willow, others were serrated like an elm’s, a few were lobed like a maple’s, and one was small and round like a young dogwood’s. They were all from species of Viburnum. “Is there a simple answer to that question?” I finally asked, a little hesitantly. “No, unfortunately there’s not,” Donoghue said, laughing. There are partial answers: theories that apply to particular species or environments. Donoghue advances one of these answers in his most recent paper. He hopes someday to find a larger Answer: one that applies to all species of Viburnum. Such an Answer is still far off, but maybe one day Donoghue and Edwards and Sinnott-Armstrong will find it. And once they have found it, maybe another Answer—one that applies to all plants, not merely Viburnum—will follow. We were in the greenhouse. It was humid and warm and so green that you could hardly bear to look at it, and Donoghue was walking back from the microscopes in the far room carrying a magnolia bloom. The bloom was small and olive green in his wrinkled hand, like a pea pod, and he held it gently. The students were already leaving their sketchbooks, starting to gather round. Donoghue pinched the bloom and began to pull. Little green flakes came away. He was peeling it like an onion, and it came undone in tiny green layers. The students watched around him. The outer layer of the magnolia lay in flakes on the floor. Inside, the flower was as green as grass in spring. Tiny stalks curled inward. “These are the stamens,” Donoghue said. He pulled one away and looked at it. It was thinner than a needle. “And then we can go deeper,” Donoghue said, dropping the stamen. He applied himself again to the bud, removing the stamens and then, with a lover’s lightness, peeling tiny green flakes away from the center. The class watched in silence. The magnolia was now smaller than a thimble. Donoghue peeled off the last green flake. At the center of the magnolia, there was a tiny stalk of darkest green. Donoghue named it the carpel and held it aloft. He told the class they should try to draw it. It was the ovary of the flower. — Henry Reichard is a senior in Silliman College.